This figure is based on the original manufacturer’s estimates of how many pages a cartridge prints and is for comparison purposes only. It is derived from the international ISO standard for printing (ISO/IEC 24711 and 24712). For the vast majority of cartridges this means a 5% coverage printed onto plain A4 paper. Brother DCP-377cw Printer To acquire NEW Brother DCP-377cw ink cartridges on a regular basis can end up costing you a bomb, whilst you're NOT receiving the full amount to what you should be in terms of the quantity of ink! 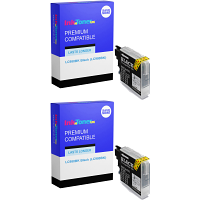 - - At InkNTonerUK we retail ALL the Brother DCP-377cw ink cartridges you'll need to keep your DCP-377cw functioning to its full potential, all the time! 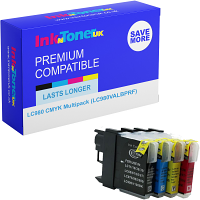 - The products obtained here at InkNTonerUK are never less than the constant premium quality, with long lasting life spans as the ink capacity is filled to the brim! - Why miss out!? Select your option of purchase, and obtain your new LOW-COST Brother DCP-377cw ink cartridges today, and join our broad list of contented patrons! When operating your Brother DCP-377cw printer do have a necessity to print in larger quantities within a print-job? 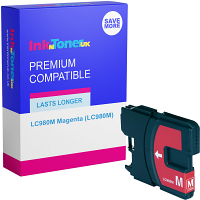 If so, then this product is just the thing, displaying you with consistently high-quality results with use of your NEW Brother DCP-377cw ink cartridges, at speeds of UP TOO; 33 PP, (Prints per minute) in Mono (Black) and 27 PPM in Colour! - Be it for work related issues, school work, or leisure, the DCP-377cw will function for that purpose, as it has ability to present its prints on an array of different media types, including; Plain paper, inkjet, glossy, transparencies and MORE! Being a modernized, beneficial multifunctional device, the Brother DCP-377cw can be utilized in a range of different environments which use the facility of printing, primarily smaller medium sized offices, and for general home usage! 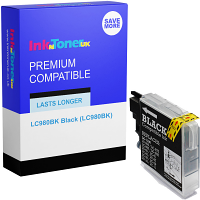 - Now that you've established InkNTonerUK, your NEW cost-effective source of the appropriate Brother DCP-377cw ink cartridges, getting more function from your DCP-377cw printer overall! This product is 'Energy Star' qualified, an additional money-saving benefit to your NEW Brother DCP-377cw ink cartridges - InkNTonerUK aim solely to save you money in the long run, so 'Bookmark' this page for a simplicity in getting where you are now each time you require purchase!